XMAS REAL DEALS FOR YOU XMAS. 1/2 Drive Sockets & Accessorie. 1/4 Drive Sockets & Accessorie. 3/8 Drive Sockets & Accessorie. Alternator Belt & Pulley Tools. Glue Guns & Glue Sticks. Hex, TRX, Ribe & Spline Keys. Hook & Caliper Face Spanners. Hub Nut Sockets & Tools. Spark Plug and Coil Tools. Timing Setting & Locking Tools. Wheel & Hub Nut Sockets. 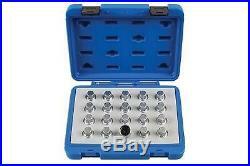 Laser 6861 Locking Wheel Nut Key Set - Vauxhall/Opel 20pc. Quality Tools From Laser Laser 6861 Locking Wheel Nut Key Set - Vauxhall/Opel 20pc Factory fitted Locking wheel nuts are fitted as a set of 4 nuts matched to one key. Vauxhall/Opel list a total of 67 locking wheel nut keys against OEM number Z16512 for the applications listed below. Because of this it is not possible to give definitive list of model applications against any one particular key. Laser has taken the 67 locking keys and separated them by key numbers into 4 conveniently sized kits. The 6860 kit is made up of the seven keys with a 4 digit code as listed below. For 3 digit key codes please see 6861, 6862 and 6863. The OEM key numbers listed are equivalent to the key numbers shown in the original manufacturers vehicle service details and on the original wheel locking key. Top Rated Tools is a tool supplier based in North Yorkshire, and has been an online presence since 2003. We have multiple online stores and offer a comprehensive selection of items covering all needs including: Home & DIY, Industrial, Mechanics Tools, Gardening, Building Supplies and much more. If you can't see it on the site please let us know as we can usually source it for you! As a small business you know you will be able to deal with the same member of the customer service team with your problem rather than waiting on hold or having to deal with an automated call centre. Our experience has allowed us to develop strong professional links with the top suppliers of tools in the UK, we offer items from a range of top quality tool companies. We cover all bases from cheaper DIY Tools to top-end industrial parts. Take a look and rest assured we will do our best to provide a one-stop shop for all your needs! We will dispatch items within 48 working hours of the order being processed. We process all order up until 2.30pm, after this time the order is processed the following day. I think my item is lost. Postmen and women may also leave parcels with neighbours, behind bins or in outhouses etc. We will need the following points confirming. You agree to return to us, at our cost, any replacement items which subsequently turn up. Where you have confirmed in writing that your item has not been received and all of the above information has been provided we will arrange a replacement item. Sadly instances of fraud are on the increase. The cost of fraud has to be passed on to all buyers in the form of higher costs. If you are looking to return an item or you would like to send us a cheque or postal address please send to the address on the original parcel or on the invoice provided. Gunson G4008 Trakrite Wheel Alignment Gauge. Sealey SX03921 Alloy Wheel Ultra-Power Impact Socket 21mm 1/2Sq Drive. Sealey SX03919 Alloy Wheel Ultra-Power Impact Socket 19mm 1/2Sq Drive. Sealey SX009 Impact Socket 40mm Deep 1/2Sq Drive. Sealey SX015 Impact Socket 65mm Thin Wall 3/4Sq Drive. Sealey SX013 Impact Socket 46mm 3/4Sq Drive. Sealey SX03023 Alloy Wheel Impact Socket 23mm 1/2Sq Drive. Gunson 77066 Trakrite Camber Gauge. WHAT OUR CUSTOMERS ARE SAYINH ABOUT US. Gedore 15/16AF 1 B Combination spanner with same size each end 6006440. Looks to be a quality pieve of kit, A +++ recommended. Sealey WCR01 Wheel Clamp Upgrade for Motorcycle Lifts. Gedore 6232450 - 11/32 Socket 3/8 hexagon Drive UD profile. Sealey LED307 Rechargeable Inspection Lamp 24 SMD + 7 LED Lithium-ion. Sealey AK3015 Tap & Die Set 32pc Split Dies - Metric. Laser 6547 Connector Removal Tool VAG/Porsche. Gunson 77136 Pare-Brise Installation Set outils. Gunson G4055B Colortune / Hi-Gauge Adaptor Kit 12mm. Gunson G4074 Colortune Single Plug Kit. Sealey VS0274 Pocket Brake Fluid Tester. The item "Laser 6861 Locking Wheel Nut Key Set Vauxhall/Opel 20pc" is in sale since Thursday, August 3, 2017. This item is in the category "Vehicle Parts & Accessories\Garage Equipment & Tools\Hand Tools\Other Hand Tools". The seller is "toolboxkinguk" and is located in Giggleswick. This item can be shipped worldwide.